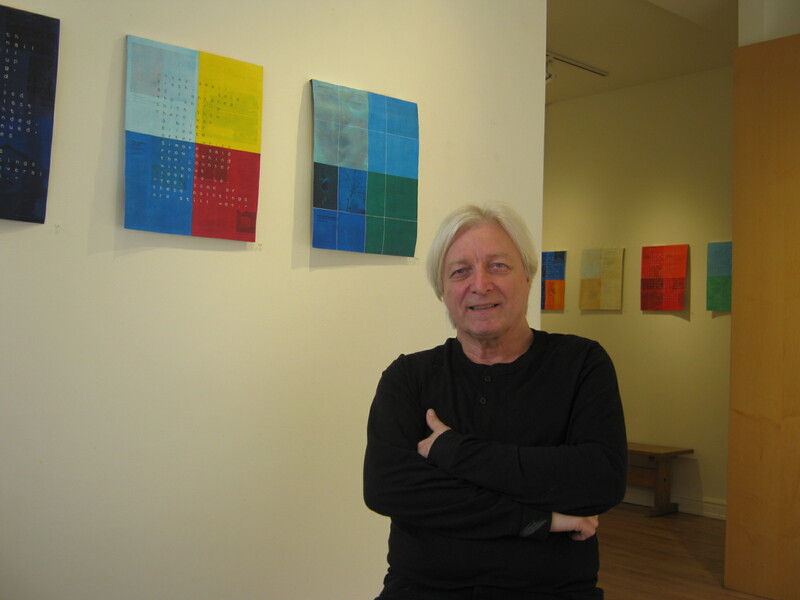 Artist Steve Rockwell’s exhibition Folio opened at Fran Hill Gallery (285 Rushton Rd., Toronto – St. Clair and Rushton Rd., west of Bathurst) on Thursday night. I wasn’t able to make it to the opening, so I dropped by last night to chat with Fran and Steve about the work. Text. From Meditations on Space, a narrative performance piece – later produced in a book detailing Rockwell’s exploration of and interactions in gallery storage spaces, recording his impressions in both text and photographs as he visited galleries in Toronto, LA, New York and locations in Europe. In the book, each gallery blurb is a short text piece, about the length of a tweet – only, in this case, the experience was physical instead of virtual – each one a funny, surprising and detailed description of his interaction with gallery owners and the space. And the photographs include some whimsical shots of his self-portrait in the storage spaces. Background. A collage of pages from dART INTERNATIONAL magazine, of which Rockwell is the founding editor and publisher, publishing two to three times a year. Colour. Rockwell’s Color Match board game, where players receive a predetermined number of coloured cardboard tiles and place them on a square board divided into a grid to create a multi-coloured, mosaic-like pattern. The judge of the game can be randomly selected from the crowd in the space where the game is being played. Unlike conventional board games, players do not accumulate things – they contribute – and there are no winners or losers. Turn over the colour tiles and each has a name and I.D. 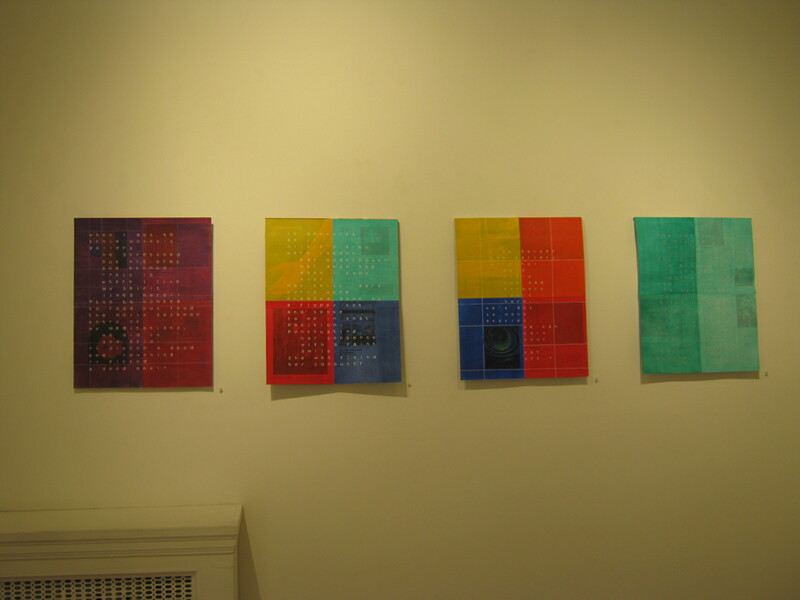 number – names like “Antidote,” “Stop!” and “Game Over.” Color Match was played on buses during Nuit Blanche 2006 in Toronto and you can see an example of pieces created using Colour Match in Art Gallery of Ontario advertising – framed works hung on the wall of the room in the photograph. Keep an eye out for upcoming Color Match tournaments at Fran Hill Gallery in Toronto and elsewhere. You never know when a match might pop up. Concept. Rockwell’s Gallery Space 1988 project started with gallery folks locating their gallery on a grid, also indicating on their grid sheet which “wall” of the space the door should go on (north, south, east or west side of the square). The visual/spatial data gathered via these grid sheets (collected in a bound volume as part of that exhibit) culminated in the creation of a 3-D floor plan model. The resulting maze-like piece identifies each gallery, the “doors” of each leading into another gallery. Information to connection. The Folio exhibit is a series of 13 ¾” X 17” unframed, protectively coated pieces on paper, hung in such a way that each is set slightly away from the wall, moving banner-like with the air currents in the room. The four-colour grid used in each brings to mind the family standards of heraldry – like in Game of Thrones – and most include hand-written text, in black or white, from Meditations on Space. 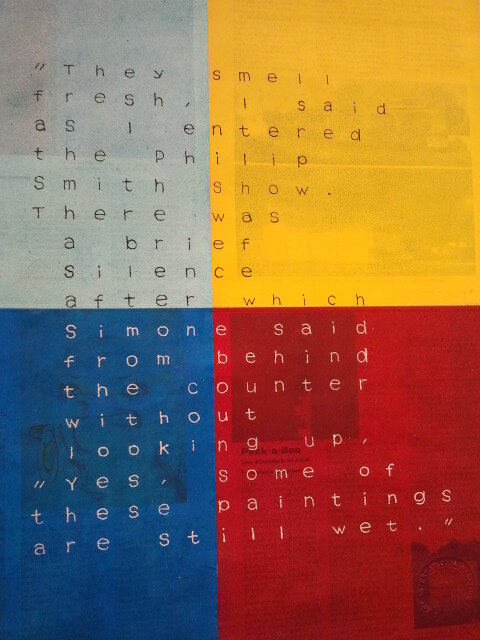 Others have no text, but the original magazine page text and images can be seen through the paint. Rockwell is like a visual data analyst – collecting, deconstructing and creating works using the concepts of space, interaction, connection and colour. It’s a lot like life that way, really. And as we were chatting, he also told me about another interesting project – in this case, an edible one. Collaborating with restauranteur Saeed Mohamed, Rockwell created the dArt Burger, a BQM hamburger sandwich. The burger was deconstructed into The Pixilated dArt Burger for an installation piece – and I can only imagine what a delicious temptation that was for exhibit visitors. You can order the dArt Burger at BQM locations in Toronto on Ossington Ave. and Queen St. West. Rockwell’s Folio exhibit is up at Fran Hill Gallery until May 19. Hours: Tuesday – Sunday, 11 a.m. – 6 p.m. or by appointment. Artist Steve Rockwell at Fran Hill Gallery for his Folio exhibit. 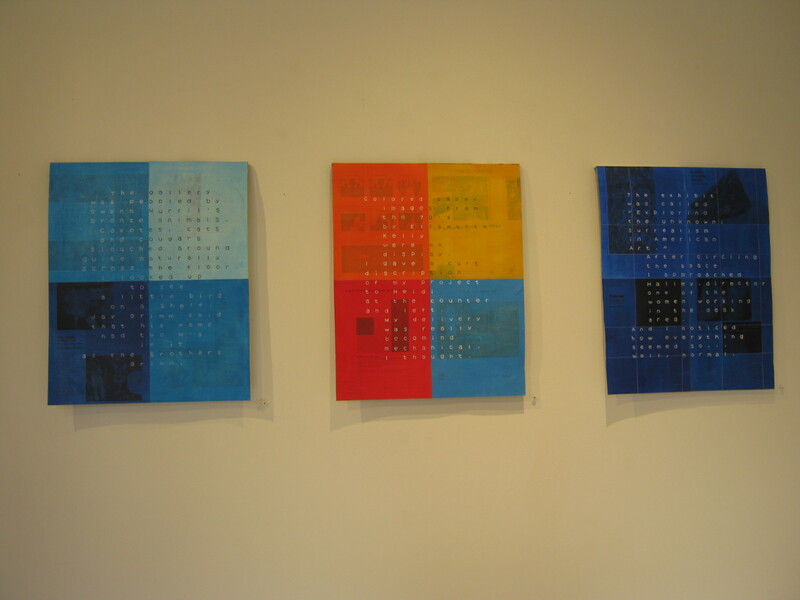 Three pieces from the Folio exhibit – Steve Rockwell. 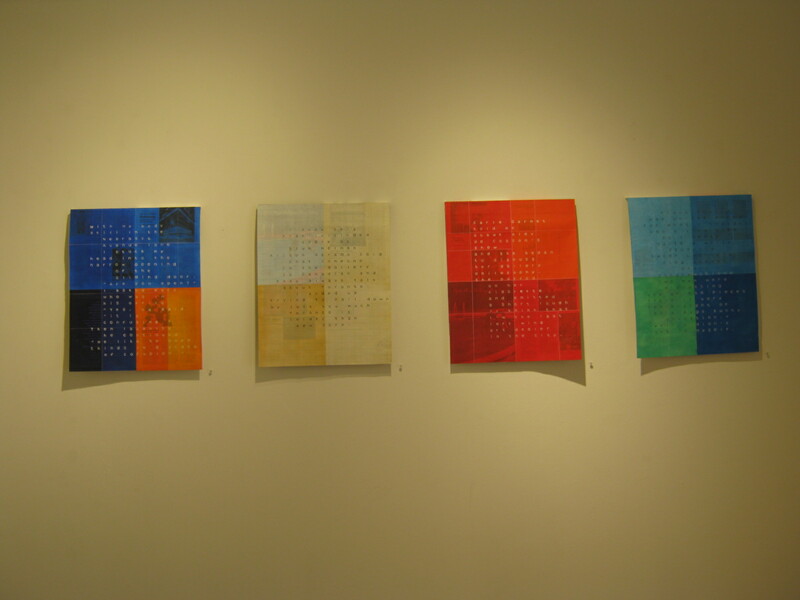 A grouping of four pieces in Steve Rockwell’s Folio exhibit. Another selection of works from Folio – Steve Rockwell. My favourite of the Folio pieces – both for the colour and the hilarious text.